The Ram ProMaster City makes the most sense to us in base configuration, but a Wagon SLT may make a viable family van if you're looking for something a little quirky. Think of the Ram ProMaster City as a tall wagon for commercial users and you're on the right track. It makes a lot of sense in urban areas thanks to its excellent maneuverability and small footprint. The 2017 Ram ProMaster City isn't quite a family hauler, but it is exceptionally well-suited to other uses—think urban fleets and business like florists, painters, and plumbers, who might want or need a cargo or delivery van without the size, heft, and fuel consumption of what has traditionally been offered on the market. 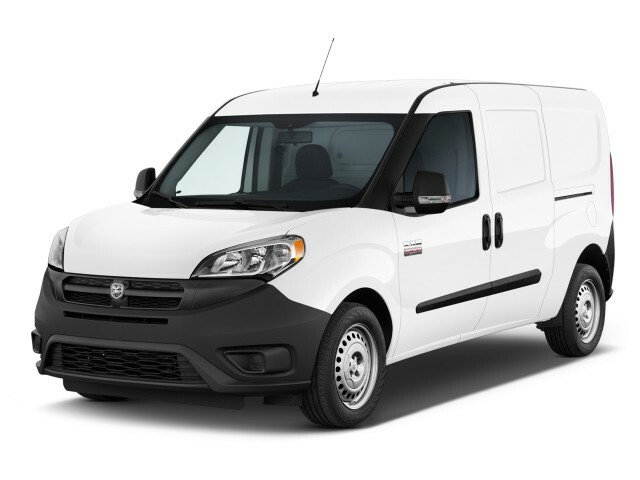 Ram offers the ProMaster City in two configurations and two trim levels; the Tradesman, available in base and SLT forms, is a cargo van with no rear side windows or seats, while the Wagon in base and SLT variants has room for passengers and windows for them to look out of. The Tradesman is a traditional work van in a small package, while the Wagon is positioned as a runabout people-hauler for hotel shuttle duty and the like. Against the Nissan NV200, Chevrolet City Express, and Ford Transit Connect, the ProMaster City aims directly at small business owners and urban fleets. Almost no changes were made to the ProMaster City for 2017 aside from some additional reflectors and revised lighting for the gear lever. Just like its rivals, the ProMaster City is positioned as a smarter, more cost-effective alternative to full-size vans—with far better fuel efficiency and substantially reduced total operating costs. The ProMaster City is essentially a redesigned version of the Fiat Doblo, a model that has long been sold in global markets. It is built in Turkey, but to skirt additional import duties levied on imported commercial vehicles, it is converted from passenger to cargo use at a facility in Baltimore. In design, the ProMaster City looks like what it is, essentially: a boxy smaller van, mated with the front end of a tidy compact crossover—or simply a minivan with a larger snout—the ProMaster City is all business, but finished with some nice details. Up front, the van's style is decidedly bulbous, looking more like the big ProMaster full-size vans than the chiseled Ram pickup trucks. And that's no surprise since the big ProMaster is also a Fiat design. The ProMaster City's crosshair grille and big headlights keep the look rounded and assertive yet almost cartoonish, while inside it gets a nicer interior and instrument panel—one that was redesigned for the U.S. market to match up with those other Ram (and Dodge) models. 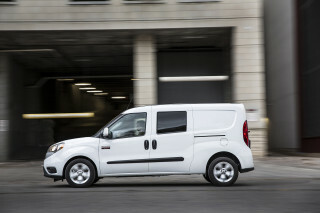 The ProMaster City packs some familiar American market motivation under its hood, however. Power is provided by Chrysler's 2.4-liter inline-4, rated here at 178 horsepower and 174 pound-feet of torque. All ProMaster City vans are front-wheel drive and utilize a 9-speed automatic transmission. In real world city driving, the ProMaster City feels nearly as responsive as a small car. With its terrific sight lines afforded by a high seating position, it is a confident urban runabout. On the highway, it isn't quite as relaxed, but sound deadening added last year and a switch to a different tire tread helped mute road noise. Ram quotes the ProMaster City at 9.8 seconds for the 0-60 mph sprint, but the 9-speed automatic transmission is geared more for urban get-up-and-go. With a 2,000 pound towing capacity, the ProMaster City could be used for a small food trailer or utility trailer. Certainly, the ProMaster City isn't designed for luxury, but its interior is comfortable and well laid out with good space for items like clipboards, drinks, and pens. 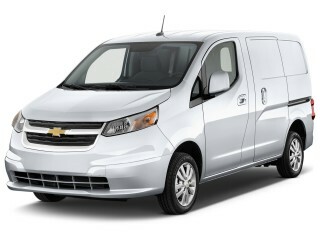 The ProMaster City is offered in Tradesman and Wagon body styles in base and SLT grades. 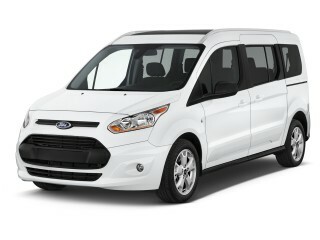 The cargo models are panel vans (with optional windows), while the Wagon offers back seats and rear side windows. In both versions, the rearmost window area remains covered by metal. Although Ford's Transit Connect offers a choice between side-opening doors and a more conventional hatchback layout, the ProMaster City's setup brings only 60/40-split rear doors; the doors can open to 180 degrees, and the smaller one opens to the curb side. In back, there's 48.4 inches between the wheel wells allows loading a full-size pallet. The cargo width is a best-in-class 60.4 inches, and total cargo volume is almost 132 cubic feet. Wagon models offer seating for three across a 60/40-split bench in back, while each section can tumble forward. With the rear seats folded, there's almost 6 feet of cargo-floor length. And cargo models offer six tie-down rings, with a combined 1,000-pound rating, to help hold goods in a stable position. It's highly unlikely that there will be comprehensive occupant-safety tests on the ProMaster City, and neither the IIHS or the NHTSA have tested it, but the expected safety features are included—standard electronic stability control, front-seat side and side-curtain airbags, a driver's knee airbag. You can also get a rearview camera system and parking sensors, but not automatic emergency braking. SLTs add to base models nicer upholstery, upgraded wheels, and a handful of other cosmetic items. Most optional equipment on both models is aimed at commercial users—special roof rack systems, graphics packages, towing accessories, and cargo partitions are on the options list. A 5.0-inch touchscreen infotainment system is standard on SLTs and optional on Tradesman models, which include a more basic radio. Navigation is an option on all models. Fuel economy ratings are an impressive 21 mpg city, 29 highway, 24 combined.